A recreation of September 11, 2001, United 93 focuses on the passengers who fought back that fateful day, but also captures, almost in real time, the mounting horror and confusion among air traffic controllers as the seminal events unfolded. It's the morning of September 11, 2001, and travelers at Newark airport make their way to United Airlines Flight 93 to San Francisco. The passengers include four Al-Qaeda terrorists sitting in the First Class cabin. Meanwhile air traffic controllers lose touch with American Airlines Flight 11, and soon realize it has been hijacked. When the World Trade Centre is struck by an airplane, officials at the Federal Aviation Authority and at Norad headquarters are stunned, and a garbled transmission suggests that terrorists have control of more planes. Soon, a second plane crashes into the WTC, and amid the confusion there is a growing understanding that the country is under attack and every flight is considered suspect. On board United 93 the terrorists make their move, take control of the plane, killing the pilot, co-pilot and one of the flight attendants, and steer towards Washington DC. The passengers are at first frazzled but then start using airphones to call their family members. News filters in about the attacks in New York and the most recent explosion at the Pentagon. 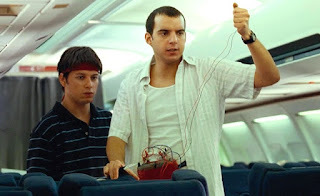 A group of passengers realize that United 93 is now on a suicide mission, and decide to take matters into their own hands to try and retake control of the plane. Directed by Paul Greengrass and featuring unknown actors and a few amateurs playing themselves, United 93 is poignant look back at infamous events. Greengrass wrote the film with the cooperation of the United 93 victims' families, and portrays what happened on board the flight using the best available information. Greengrass is careful not to create anything resembling theatrics, overt heroism, or individualism. This is a surprisingly low key drama about a group of passengers and flight attendants who come face to face with unspeakable evil in the sky, and decide to take collective, spur-of-the-moment action. Almost none of the characters are referred to by name, the film emphasizing the reality of people who are strangers to each other being thrust into history's maelstrom. Filmed with handheld cameras, natural dialogue and delivered in a silent witness style, United 93 also recounts events on the ground in the different control rooms intended to guard the safety of airspace over the eastern seaboard. Greengrass captures normalcy giving way to terror, as a day that starts as any other gradually unravels, a sense of disbelief slowly creeping over the workers at their control stations as events cascade. Confusion soon sweeps through, resulting in mismanagement, wasted time and resources, and abject frustration, and a nation comes face to face with its lack of readiness to confront a devious enemy. The four terrorists are mostly peripheral characters until the final act, and Greengrass portrays them as determined, devout yet also unsure of their influence over the passengers and in their own way fighting off panic. The dynamic of a small group of madmen facing off against a larger group of victims, neither quite in control of what comes next, perfectly captures the essence of the day. United 93 derives enormous power precisely by recalling how ordinary life appeared to be before everything changed. Just as many lives were lost with shocking suddenness, so was the innocence of a nation.